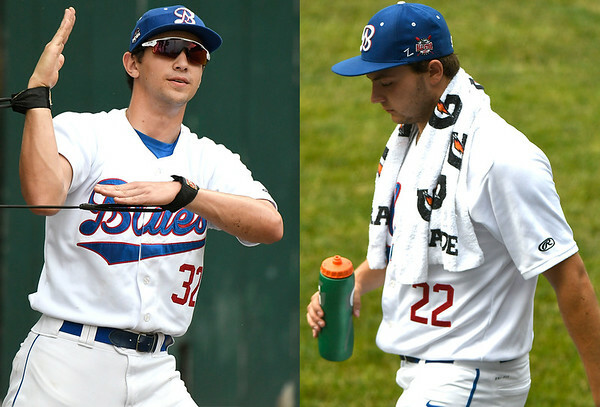 BRISTOL - The Bristol Blues have an electric pitching staff that has tallied 298 strikeouts so far this season, the most in the Futures League. The Blues have been led by starter Jared Kollar and reliever Neal McDermott, who held the top two spots among league leaders entering Tuesday night’s games. Kollar has been strong at the top of the rotation for the Blues. He picked up his third win of the season Sunday against the Nashua Silver Knights. Kollar has struggled at times, giving up at least three runs in three of his six starts this season, and has a 4.55 ERA. But he has still found a way to keep his team in games. Bristol has lost just one of his starts so far this season and Kollar has a 3-1 record. McDermott has been the team’s best pitcher out of the bullpen all season long. In 14 games, McDermott has 11 saves and just one blown opportunity. He has a 1.10 ERA with 32 strikeouts. Whenever he comes in the game, it’s assumed he’s going to shut the door. Kollar has 35 strikeouts this season, the most in the league, including 16 in his last two games. Meanwhile, McDermott has struck out at least one batter in every outing except one this season. But Palmer sees their impact off the field as the biggest difference maker for Bristol. The two pitchers are also college teammates, having just completed their freshman seasons at Seton Hill University. Palmer admits that it can be challenging with younger pitchers, but he always leans on the college coaches for help. Palmer gives the credit to the two pitchers, but also the coaching staff at Seton Hill. Posted in New Britain Herald, Bristol Blues on Tuesday, 10 July 2018 21:21. Updated: Tuesday, 10 July 2018 21:23.